Hot off the press, this motion was passed unanimously at today’s station meeting. Station staff are furious at this blatant attack on their jobs! Condemns Metro’s latest attack on station staff jobs and whole heartedly supports the motion that has been passed unanimously by RTBU station staff members at the four control desk locations that are currently under threat (Reservoir, Clifton Hill, Heidelberg & Eltham). We condemn Metro for the proposal to shut control desks at these locations, affecting ongoing local jobs which will result in job cuts of over 40 people on this line alone, along with reduction in local safety in local areas. Further, this meeting supports our members in the Clifton Hill group under direct attack from management and authorises actions in support of our members should they be denied at any stage access to RTBU representation and support in line with the current EBA. This meeting notes that Metro managements’ failure to respond to the Status quo provisions and to follow the EBA dispute settling provisions is indicative of their arrogance which directly contradicts their stated aims of equity, trust, partnership and service. This meeting notes that this project is estimated to cost over $2.5 million dollars in the region, money which could be spent on addressing the chronic understaffing of stations, with 21 stations unstaffed in the Clifton Hill group alone. The RTBU remains willing to discuss proposals to improve local control desks located at out stations, through initiatives such as the provision of more cameras, including movable cameras controlled by the operator and more emergency red buttons located at more points on the stations and at bus bays etc. The RTBU does not support the removal of any existing control desk functions and views managements tactics as a threat to all control desks in the Network. Calls on the RTBU to ramp up a joint union and community campaign in each of the affected areas, so that the local community is made aware about the threat to jobs in their area and also the threat to safety for passengers at each location and along that line. The campaign is to be coordinated by an action committee consisting of RTBU officials, Delegates and interested members. The campaign shall also involve holding rallies and community pickets at the affected control desk stations, commencing on Wednesday 31 January 2018. Local MP’s, members, Delegates, community activists and supporters are to be encouraged to attend. Calls on the RTBU to form deputations of Delegates, officials and members to lobby the local State Members of Parliament at each location (MP Richard Wynne, MP Anthony Carbines, MP Vicki Ward & MP Robin Scott). This is to inform them of these drastic changes that are being proposed and that were negotiated last year as part of the MR4 negotiations between Metro, PTV & the State Government, and remind each of these Members of Parliament about Labor’s commitment to safety in the area, along with the commitment of jobs. It should be made clear to each Member of Parliament that the RTBU is serious in ensuring our members jobs are protected and that passenger safety is not put at risk or in any way reduced and that our campaign will continue throughout the year in their electorate in the run up to the next state election. Calls on the RTBU Branch Secretary Luba Grigorovitch to demand a meeting with the Minister of Public Transport as a matter of urgency around this matter. That the Branch Secretary also arrange meetings with PTV and VicTrack. 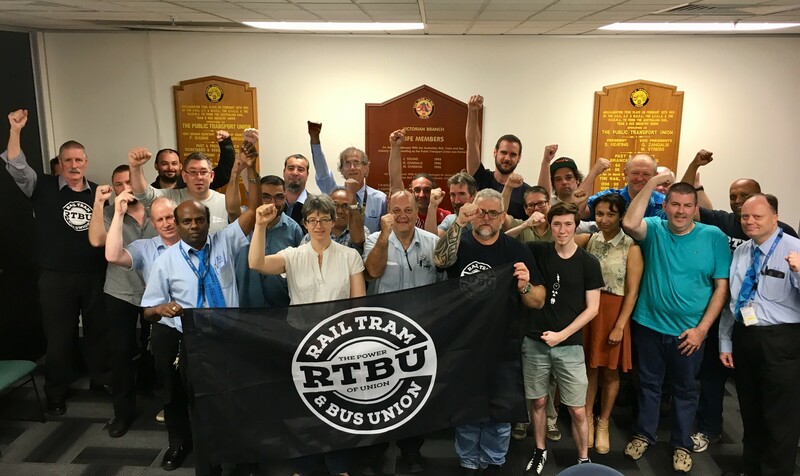 Instructs Joe Maisano, RTBU Organiser to raise this major issue at the Rail Divisions committee of management meeting and the RTBU executive meeting calling on other grades to help support the Station grades on the attack from Metro management.